Upholstered armless occasional chair, possibly part of the "Modern Mates" collection. Excellent Restored Condition. Refinished legs, complete new upholstery 2008. Very tight and sturdy. NB: A set of six of these chairs is currently available, and will be shown with a Robsjohn-Gibbings dining room group at our "Designer Modern" show in September. 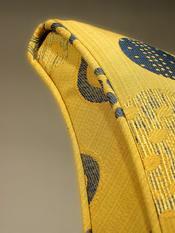 For your input into upholstery / cover options until that time, please contact the gallery.